Printer: Vizetelly, Branston & Co.
Public cemeteries were first established in Britain during the Victorian period. Under public law every parishioner and inhabitant of a parish had a right to be buried in the grounds their church unless they had committed a serious crime or killed themselves. By 1850 most London cemeteries were very overcrowded and many bodies were buried in shallow graves. In the worst cases, corpses were interred under the floorboards of schools and chapels. 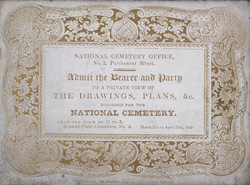 The foul smelling air that resulted posed a severe health risk and in 1845 the National Society for the Abolition of Burials in Towns was established to encourage the building of cemeteries outside urban areas. In 1852, an Act was passed by the General Board of Health to open cemeteries all around the outskirts of London.